As much as 25.7 billion VND (1.11 million USD) was raised in support of the disabled and orphans nationwide during the 16th music programme “One heart – One world” in Hanoi on April 14. 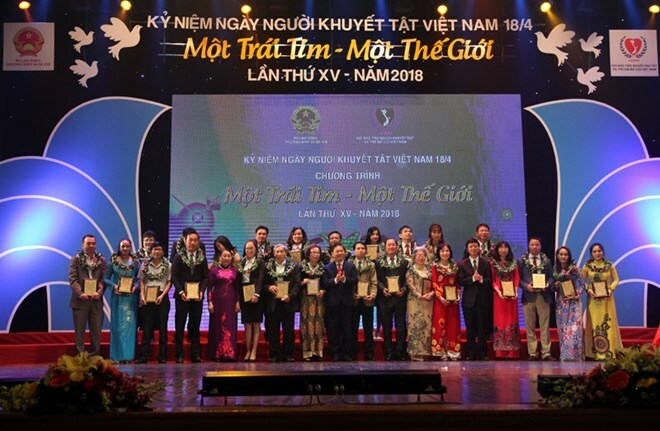 The event was co-organised by the Association for the Support of Vietnamese Handicapped and Orphans (ASVHO); the Ministry of Labour, Invalids and Social Affairs; the Ministry of Culture, Sports and Tourism and Radio The Voice of Vietnam on the occasion of Vietnam Day for Persons with Disabilities (April 18). It aimed to honour outstanding people living with disabilities and philanthropists at home and abroad for their contributions to improving lives of the disabled. On the occasion, an awards ceremony for the second singing contest for people with disabilities in the north was also held. The organising board presented 13 golds and 21 silvers to the best performances at the contest. Over the past 27 years, the AVSHO and its 46 provincial chapters have become trustworthy friends for philanthropists, the disabled and orphan children. In 2018, the association raised 591 billion VND and provided support for over 4.1 million handicapped people, orphans and other vulnerable groups. Vietnam is now home to nearly 8 million people living with disabilities and 400,000 orphans.